In a large bowl whisk together flour, cocoa powder, baking soda, baking powder, cinnamon and salt. Whisk in both sugars. In a medium bowl whisk eggs, water and vanilla. Add sour cream and oil and mix well. Add the wet ingredients to the dry and mix until no dry ingredients remain. Scoop batter into cupcake pan and bake for 18 to 20 minutes. Place bags of frosting into a large decorating bag with a #4B tip. Pipe swirls on top of each cupcake. Sprinkle with blue sanding sugar and silver stars. TaDa! 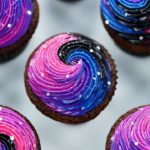 Dazzle your friends with these sparkling Galaxy Cupcakes!